Ken Moroney leader of the Black Knight's who undermined the reform unit set up by the Wood Royal Commission. Maroney, who's tentacles stretch throughout the Force. As reported in SMH May 29 02, three sons who are police officers. 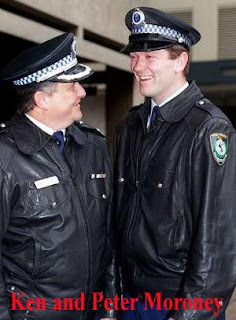 Michael a detective senior constable at Liverpool, Peter an officer of the same rank attached to the NSW Crime Commission. Peter's wife Ruth, is a policewoman, and nephew, Luke, is at the academy. For the next 18 months to two years, the government has thrown us the dummy all right and Moroney, the chameleon used as a pawn by Bob Carr, is now showing his colours. As reported by CH 9 news this morning with the new establishment of the old corrupt crime squads. Maroney was selected because Bob Carr saw him as a non-controversial, and exceedingly supportive of the Carr Government. Carr hopes this will pave the way to a controversy free election campaign. The question is how do we find detectives who have not been compromised like WS13 witness in the Wood Royal Commission into police corruption? " I knew I was stuck". He said, " I was starting out as a detective. I would have been branded as a dog, that's an informer, and my career would have been finished." Compromised for life. So if you want to form these specialist squads. Black Night, it's a long way to go home. In fact you may need a Carr government integrity check and the best place to start is a Parliamentary inquiry into the demise of the reform unit set up by Wood. Now, you're being interfered with by dogs while your minding your own business and it's made harder to escape, by the abolishment of your bail rights that has suggested targets repeat offenders but has cleverly collected everyone with a previous criminal history. Now 3 new Jails is it any wonder. Level 4. Clive Small applies for the Commissioner. Level 5. Costa gets his cop, and it's that top bloke Uncle Ken. Level 6. Don't go away now, it's not over yet.